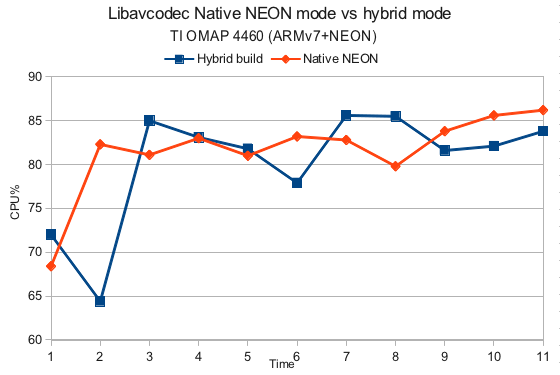 Benchmarks using the latest VLC beta and benching whether a native build solely for NEON is faster or a hybrid build. The expectation is that the native build should be very slightly faster than the hybrid build. This is done on a TI OMAP 4460 (Galaxy Nexus). Method is same as previous benchmarks. Ironically, it appears that the hybrid build is slightly faster(?) than the native NEON build, although in practice there is no real difference for the user. So the proper result should be inconclusive.